Excited to see the Fin Whales but not so exciting were the crowds in Tadoussac, Quebec, Canada. 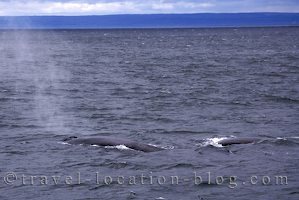 a whale watching tour from Tadoussac, Quebec. Yesterday was a wet and miserable day, so we used it to travel. From Sainte-Anne-des-Monts in the Haute-Gaspesie drove to Matane where we took the ferry to the town of Godbout across the Gulf of St Lawrence. On arrival, we stopped in at the information centre briefly to get some brochures etc on the area and then drove from Godbout to the town of Tadoussac - a tourist hotspot! Here we found a campground near the sand dunes which was set in a forest and had all the facilities we needed that night. The campground was also set up to take bookings for whale watching which is the biggest tourist attraction in Tadoussac, so we made our booking for 10am. People flock here to see the Fin Whales in their thousands each summer and the local whale watching companies welcome them with open arms, offering trips in their boats which can cater for numbers between 200 - 700 passengers. To be honest we couldn't think of anything worse than whale watching with these huge numbers of people, but figured they wouldn't be so full during our trip since it's fairly late in the season .... hmmmmm. We drove into town and found a park out near the marina beside the Marine Interpretation Centre (Centre d'Interpretation des Mammiferes Marins) and close to the wharf. It's pay parking although we suspect that's the only option in Tadoussac. We wondered around the Interpretation Centre for a while photographing the building and then walked across the road to check out the tidy marina before walking the 300 metres to where the whale watching tour departed from just as it started to drizzle with rain. When we arrived at the departure point, we were happy to see that there were only a few people hanging around waiting to embark on the tour, and took cover with them under the gazebo from the brief shower of rain. There would probably be more showers since the day was looking pretty gloomy and rain was predicted. The large boat soon arrived at the wharf after fueling up, though we were not able to board at that point as they were still getting ready for the tour. Then our hearts sunk - a large tour coach pulled up probably between 48 to 50 seats and it was full. As the passengers spilled out on the wharf another large tour coach pulled up - equally as full. More people who were not part of the tour coach groups began to gather also and we could slowly see the boat reaching it's passenger capacity of 250. After about 15-20 minutes boarding began and it was crazy with people pushing and shoving to get the best possible spot for seeing the whales. Luckily, the boat ride out to the 'whale spot' was about 20 minutes and with the rain coming down, most people took cover either inside or under the boat canopy. The first whale sighting was bedlam! Every man for himself - take no prisoners type of behaviour! In the end Rolf and I had to work as a team - once a whale was spotted he'd move in and I'd be on the other side of the boat holding a space for him in case the whale moved or the boat turned around which it did frequently. It was madness - people were even crying 'wolf' in the end to get others to run to another part of the vessel so that they could slide into their spot! It's amazing how adults can behave worse than children! In the end we were glad when the tour was over and we were heading back to the wharf. It was nice however, to see the massive fin whales - a mother and calf. We reached the wharf and after disembarking decided to head in the direction of Quebec City. The weather was still pretty miserable, and since we had an appointment in Montreal on the 14th we decided to drive as far as Quebec City to put Montreal within easy striking distance for the following day. After skirting the northern shores of the St Lawrence then reaching Quebec City, we pulled in to a campground quite late at night. This city is as french as you can get in Canada, so our french speaking abilities were really put to the test. After finding the man in charge and using more hand signals than speech to communicate, we eventually got set up for the night.